Prime Minister Abiy Ahmed underscored the importance of strong measures to resolve Benishngul Gumuz region’s administrative and development challenges, and deal with the sources of conflict in the region. He said it when he met Benishangul Gumuz People’s Democratic Party, the party that is governing what is now one of Ethiopia’s increasingly unstable region, Central Committee Members. His “advice” for the party leaders to take decisive action came after a discussion on the current situation in the region. The primer also wants the party leaders to tap into the potential of the people in the region in general and the youth in particular for the reform movement, and the leaders have pledged to do so. He held the meeting in his own office in the capital Addis Ababa. 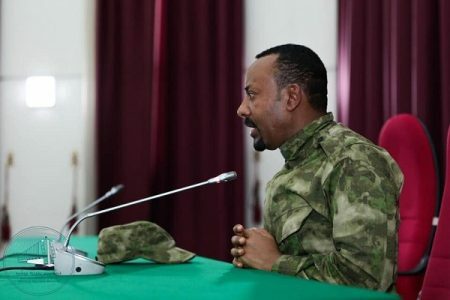 A picture released by the office of the Prime Minister shows Abiy Ahmed dressed in military fatigue while having the meeting with Benshinangul party officials. He apparently dressed in a military fatigues to attend skills demonstration event of his “Republican Guard” , which was instituted to provide maximum security for senior high ranking government officials including Prime Minister Abiy Ahmed. Benishangul Gumuz regional state, especially parts of it adjacent to western Oromia region, have been experiencing chronic security problems which affected the lives of civilians. Hundreds of people have been killed and tens of thousands of people displaced from the region in the past few months. As well, secret military training camps have been discovered in the region where political forces causing instability in the country trained their forces. This month five senior government officers linked to instability in the region were arrested.